Final Girl: "a zombie gathering"
Have you heard of these so-called "zombie walks"? See, in different cities around the world, people... umm...they...err... man, how can I describe a "zombie walk" so you'll understand? It's so complicated. Okay, stay with me. In a zombie walk, people dress up like zombies...and then they walk around. Does that make sense? Anyway, I have a hard time deciding if I think it's a cool idea or not. Perhaps I find it cooler in theory than in reality, sort of like how I feel about The Jets. I mean, obviously the world needs more Samoan family supergroups, but then their music kinda blows (yes, yes, "Crush On You" aside...however, I always found "You Got It All Over Him" more disturbing than anything else). Apparently there was a zombie walk in London recently, and CNN has a video blurb about it. I have to admit, for one second- just one second- I saw the "breaking video news" at the top of the page and "zombie invasion" on the video, and it was almost like the zombie invasion was really happening and it was kinda the best second evar. Yes, a lot can happen in my imagination in one second, and yes, I'm a big fat nerd. So watch the video and see people acting like zombies. I will say that zombies speaking with British accents sort of classes up the whole affair. I will also say that finding videos on CNN with titles like "Duck! Tomato incoming! ", "Naked beer thief", and "Plate throwing relieves stress" depressed me. 10 cool points to anyone who knows where the picture at the top of this post came from; 5 additional points for knowing exactly what that thing is. Boston had a Zombie March this past May. Couldn't go, but really wish I had. Brits take their zombie invasions pretty seriously. At least the make an attempt at being prepared! What a completely cool idea. With Halloween coming up (the holiday not the movie) things could be quite interesting. Spread the word, Come one Come all. Oops, I suppose I would need to mention a city...Any city, USA. The LA Cacophony Society held a "Zombies for Gore" march during the Democratic National Convention in 2000. There have been several here in the San Francisco area, but there's been some discussion about finding a venue that would make it interesting enough to do again. Like during Critical Mass. Or at a Renaissance Fair. I'd actually participate if we tried it during church services. Ah, thanks for a zombie thread! Any gamers out there play the Thief series? 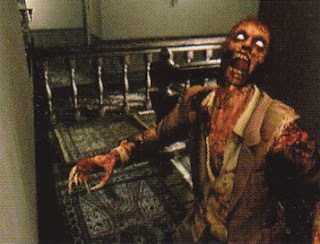 The undead in that game can scare the bejeezes out of you. Yeah, it's a crimson head zombie... the ones that come back again after you kill them and then they're wicked fast. The first time that happened in the game, I think I soiled myself. How geekily awesome would it be to do (or witness, anyway) a zombie walk at the Monroeville Mall?? Even if I were to become a zombie, I'd still walk normally. Like how even though everybody has tattoos these days, I refuse to get one. You don't have to do what everybody else is doing. The Toronto After Dark Film Festival is doing its 2nd Annual Zombie Walk in late October with it finishing up at the theatre just in time to screen two zombie films (AUTOMATON TRANSFUSION followed by the zombie musical comedy POULTRYGEIST: NIGHT OF THE CHICKEN DEAD).